James Nerang, or Jimmy as he was often known, worked as a tracker in the central-west of NSW around the turn of the 20th century. He took a prominent part in tracking Jimmy and Joe Governor after the massacre at Breelong in 1900. He was stationed at Dubbo in January 1902 when he gave evidence identifying Charles Ryan, an Aboriginal man charged with assaulting Amy Burns, an Aboriginal woman, on the road between Dubbo and Obley. Jimmy Nerang deposed that he had known Ryan for three years and had seen him in Dubbo the previous October when the assault took place Dubbo Liberal 29 January 1902: 3; Dubbo Liberal 15 November 1929: 5.. Jimmy Nerang was later the tracker at Forbes Police Salary Register 1908 SRNSW 3/2994..
Aside from tracking, Jimmy Nerang also worked as a labourer on Mungeribar Station near Narromine. He had one known child, Sarah, with Lena Waterloo. Sarah was born at Bulgandramine in 1908. 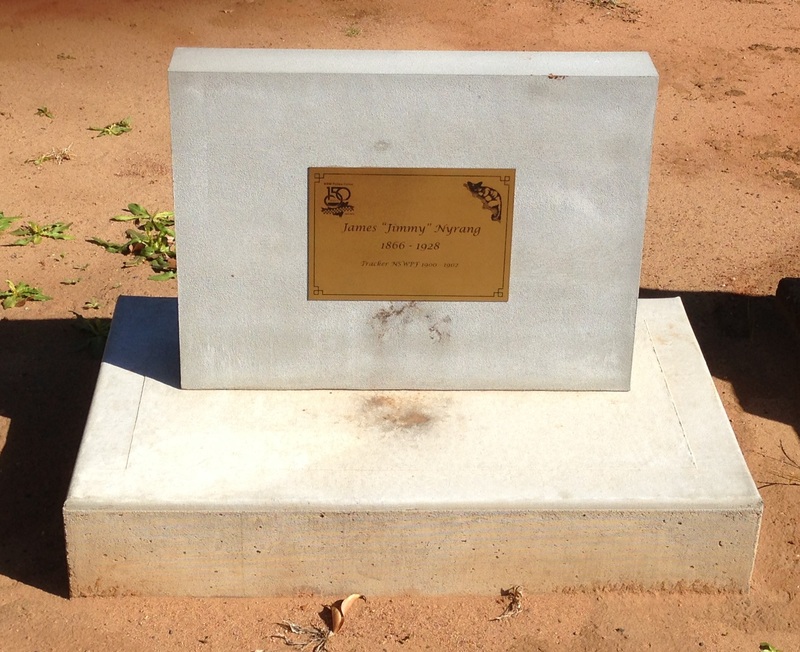 Jimmy remained in the Narromine district for the remainder of his life after retiring from the police and he died on the Dandaloo Road four miles from Narromine on 7 November 1928 aged 62 years. He is well remembered in the district by his family and the NSW Police, and in 2013 a grave stone was unveiled at Narromine Cemetery DC 1929/24084; Narromine News 29 September 1998; Dubbo Liberal 6 March 2013: 6..
1. ↑ Dubbo Liberal 29 January 1902: 3; Dubbo Liberal 15 November 1929: 5. 2. ↑ Police Salary Register 1908 SRNSW 3/2994. 3. ↑ DC 1929/24084; Narromine News 29 September 1998; Dubbo Liberal 6 March 2013: 6.